The rise of modernity, especially the European Enlightenment and its aftermath, has negatively impacted the way we understand the nature and interpretation of Christian Scripture. 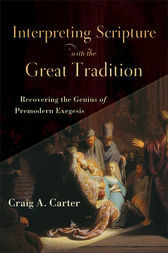 In this introduction to biblical interpretation, Craig Carter evaluates the problems of post-Enlightenment hermeneutics and offers an alternative approach: exegesis in harmony with the Great Tradition. Carter argues for the validity of patristic christological exegesis, showing that we must recover the Nicene theological tradition as the context for contemporary exegesis, and seeks to root both the nature and interpretation of Scripture firmly in trinitarian orthodoxy.